What can a Psychic tell you? Psychics are probably one of the most misunderstood groups of professionals. What can a Psychic tell you?, well most things, but solving a mystery on demand doesn’t work for me. How a person died and who did it? Who stole out my purse? Most people are unrealistic about what information we can give you. The month a persons house will sell. How much? Everything from lottery numbers to the address of the house they will move into. One lady even asked me what her shares would be worth if she sold them. Major decisions must be taken by you the client. We cannot do that for you but what we can do is suggest a positive direction. What can a psychic tell you? hopefully the truth. 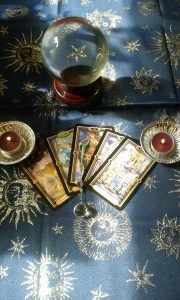 Genuine psychics are very intuitive and can pick up on most things without being given any information. We have to tune into the person we are reading for first, then let the information build up. We can see where a separation turns right around and a fresh start is coming. If the relationship has ended for good I see a brick wall on the pathway. Some times the higher power shows me symbols instead of pictures. An aluminium shoot represents a persons mental health and if they are at the bottom middle or top of the shoot. Some one at the bottom tells me a relationship has broken down or there has been a recent passing. A devastation has taken place in there lives. I conduct psychic email answers to questions, some of the content of the questions are shocking. However, if I receive any answers from the higher power, who am I to criticize? If I get no answer, then I will say so and ask the client to choose another question. Whether you are an existing client, thinking about giving a psychic email a try, then please check out my feedback and accreditation.